Nightmare mode Firebrand and Stormcaller will be your operation group’s first true test. The mechanics aren’t vastly different, but there are definitely some changes you will have to deal with that will vary your strategy from what you’ve known. For the most part, your tanks’ and healers’ roles remain unchanged but your DPS must be be at their best. I also have a major issue with the way this fight was designed, which requires certain classes that MUST be brought in order to defeat these bosses. The first thing you’ll have to plan for is the double destruction debuff. In Nightmare, the debuff no longer wears off in time before the second set goes off. A debuff called Single Destruction gets applied to the two nearest to Stormcaller’s turret. If a second Single Destruction is applied, then that player will be stunned before exploding and being killed instantly. In order to handle this you will have to have enough DPS to force the tanks into the Defensive Systems phase before the second double destruction is cast. Defensive Systems will start when one of the tank’s health is reduced by 20%. At our current gear level (mostly 63 armoring and mods), we could not reach this marker so we had to put 3 DPS onto Firebrand. This 3rd DPS was a ranged that would stand on Stormcaller to soak Double Destruction, but would focus their damage onto Firebrand. This allows enough damage to be dealt to Firebrand so that the second Double Destruction is not cast. This significantly unbalances the damage to the tanks which have to be destroyed together, but that is addressed below. Read on! As you might expect, Defensive Systems has a few changes as well. If your Stormcaller tank had a habit of kiting the electrical spikes around the boss then they will need to change their route. Staying within healing range is going to be the preferred method as the damage from the phase is a lot more substantial. The major change, however, is inside the shield generators. One of the Trandoshans inside the shield has an Overcharged Jetpack debuff. When he dies, he does AoE damage all around him. There are two methods to deal with this fellow. The first is to DPS him down low and kill him at the end as everyone is running back onto the tanks. Obviously, a ranged DPS will have to take the final shots to avoid taking any unnecessary damage. Our group’s preferred method is to pull (or push) the target out of the shield and kill him with ranged. Using this method will allow you to finish off the adds and immediately focus the DPS needed onto the bosses. Remember that extra ranged DPS on Firebrand you needed to avoid a second double destruction being cast? The final phase is a matter of timing. Upon the final Defensive Systems finishing (last 20%), the ranged DPS that was on Firebrand and an additional DPS from Firebrand will move over to Stormcaller. At this point, you will have to deal with two double destructions. 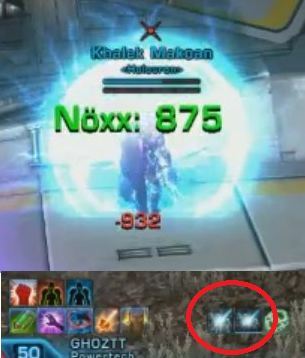 Fortunately, the additional DPS can stand next to the healer for that side and the tank can alternate left to right. The remaining DPS on Firebrand should switch to Stormcaller at about 5% and allow the Firebrand tank to finish him off alone while the rest of the DPS play catch-up on Stormcaller. Depending on your damage output, you may have to adjust the time the final DPSer moves to Stormcaller, but both tanks should die at roughly the same time. This encounter is extremely challenging and the new mechanics are fun to try and figure out. My big complaint, however, is that it pretty much requires you to have a Marauder/Sentinel in the group for that bloodlust-like buff that they bring to the table. Our operation group is in mostly 63 level armoring and mods and, without a Marauder, there was no way we were able to beat the enrage timer. Not even close. Fortunately, one of our DPS had a well geared Marauder and agreed to bring that character for this fight. Even then, we only just beat the enrage timer. This isn’t the only encounter that you have to have certain classes in order to beat it. Kephess himself also requires classes with certain abilities to be in the group in order to defeat him. Fortunately, we have the proper composition, but boss encounters should never require specific classes in order to complete. I feel this is poor design on Bioware’s part and hope that they don’t plan to make it a habit in future encounter design.